How to change the default browser set on HTC windows tablet? Re: How to make chrome as my default browser in windows 7 Professional? STEP 1: GO to START and in the search programs window type default programs and press enter.THE CONTROL PANEL window with the default program options opens up. STEP 2:Click on the first option of set your default program. a) SET THIS PROGRAM as default program.You click on it and simply you have made google chrome default browser. b) Choose default for this program is 2nd option and if you click on it it gives all the extensions of files you want to select this browser to open up by default. when you do so you save changes and you are done.. Here you will have an option to set default programs.. Select GOOGLE CHROME and set it..!! Making Chrome As Your Default Browser In Windows 7 Can Be Done In Two Steps . . . Step 1 :: Install Google Chrome . .
Good Luck . . .!!! Its is very simple, Open the Star menu, click on the default Programs , set the default browser or the default program. 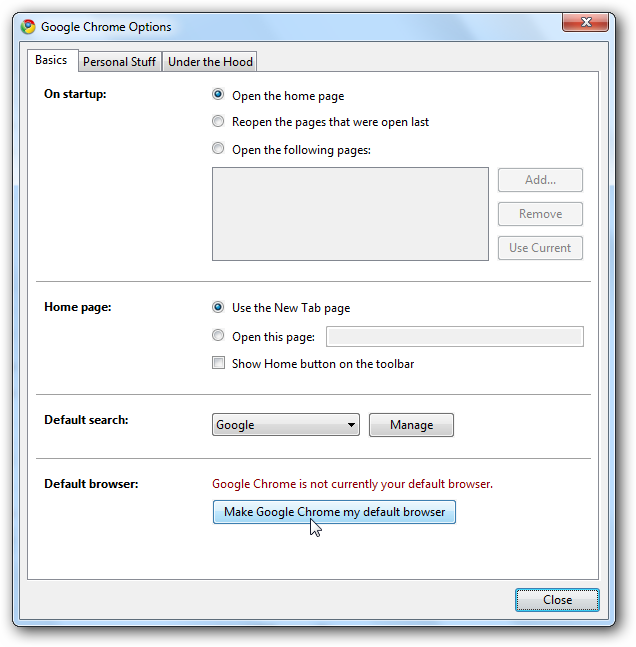 in the default program option you have to select the Google crome as the default program. Now your Google chrome is your default browser. The combination of window 7 and the google chrome id good, google chrome is faster in use in window 7. So try this . go to start menu . go in searching option in strt menu. there type "default program". after this choose first option in it . then u see a list of default program . choose chrome . then click use it my default program. you can make google chrome as your default browsers in two ways..
You can make google chrome as your default browser by making some adjustments in the settings of the google chrome and if you want to do then click on he google chrome icon then after opening the page you can go to the options of the chrome there you can see the setting or option to make chrome as your default browser then if you click on that you can enjoy the browsing in chrome making it as a default browser. You can select any browser but Google Chrome is fast and secured. It provides you the good search results which are correct and detail. You can make google chrome as your default web browser bydoing the following steps. If you want to make google chrome as your default browser. Than you can select it. we can the installation of the operative system is, Windows XP, Windows 7-- view of windows then in that many modules of the components there but surely flatters by containing to suggestion it do that a line of sight to search for the data and pry constantly to the data in the Internet then contain to use a chrome as specialist..
After the ending of the operative system in our bureau, the portable computer child etcetera. Using the Windows 7 professional as has as value predefined the constant prying of net is of chrome can the sea that the information for control board and result of search that it includes..Many of implicit OS is Internet Explorer but is the slow process for the comparison with Chrome Browser..
Have principally be accustomed plows:,, of viewfinders Internet Explorer, chrome of Google, Mozilla, the opera, earn CadShould all to prosecute to depend to our linking and satchel of the spruce die it hurries as comparative nevertheless it is the viewfinder of chrome..
You can do |google| chromium-plate so your implicit viewfinder for making certain fits in the placings of the chrome of |google| and if you want to then do clicks on he |google| chromium-plate the icon then after opening the page that it can go to the options of the chrome there can see the placing or option to do of chrome as your implicit viewfinder then if it click on that it can enjoy the constant prying in the chrome makes that it as an implicit viewfinder. It is very simple. Open Google Chrome. Then at top right-side corner. You will see Settings icon. Click on that and choose Options menu. Now at the bottom click on "Set as Default Browser". Now, Chrome is your default Web Browser. FOR SETTING THIS YOU JUST NEED TO FOLLOW THE FOLLOWING STEPS----------------GO to START and in the search programs window type default programs and press enter.THE CONTROL PANEL window with the default program options opens up. :Click on the first option of set your default program. # Click on the Start menu and click on Control Panel and select Default Program. # Click on Set Default Program. By clicking on it opens a list with Google Chrome program option. And you might select the second option when you want only those applicaations to run with Google Chrome as default browser. Hence Google Chrome is set as Your default browser. Its simple to set the default browser in system. - select the Google chrome icon and click this program is default program . again means the options show on the top showing set as default browser . I hope the above information are useful to you check it. While installing google chrome,it will ask you an option "Do you want to set chrome as an default browser".click on it and hit OK. Finally select the chrome which you want thats all. Finally it will Display as 'Default Browser is Currently Google Chrome'. ->First you have to go "START" button. ->And there you able seen the "default program" option. ->Click on it and you will seen some of files including chrome so simply select the google crome and it automatically set as your default program. then click on "settings" options. a new tab will open in the browser,and at the end of it you will have a button "make google chrome as my default browser"
you will be asked for conformation just accept it. Voila!! now google chrome is your default browser!! Now Google Chrome is your default browser. Yes you can make chrome as your default browser in windows 7. -->First you need top open GOOGLE CHROME browser. -->Click on customer and control Google chrome. -->In the default browser click make Goolge chrome as my default browser. i can give you the best answer for your question.just follow my steps. 1.its really simple,just head in to the google chrome options panel. 2.and then click the big button at the bottom..saying make google chrome my default browser. thats it you have done..all the best. STEP I :- Open Google chrome and click on tool icon at top right corner . In tool icon select settings. select google chrome as the default programme..
For making chrome as a default browser in your PC and laptop . I suggest you two simple way. First go to chrome setting option . There is a option button name "make google chrome as my default browser". Click on it and solve your problem . And you can also go to type "default programs" in your search engine . And there you can choose chrome as your default browser. 3. click on "set your default programs"
4.select google chrome(left frame) and then click on "set this program as default"
Open google chrome-->> go to settings-->> scroll down and you will see a option default browser. This is very simple way to make a chrome as default browser. Now we have two ways to change default browser preferences. * Open the settings of the Google chrome. * Go to Default browser Preference. * Click the button " make chrome as default browser " . Automatically your default browser Settings are changed. * Open the Control panel . * Open the Default Program. From control panel. * After run this program .It will return the some programs list. * Click on set as a default program . The above procedures try with one. and Google chrome made as default Browser. Go to start menu and then click on search toolbar type "default program". It will provide you default program open it after this choose first option in it . then you see a list of default program . hi my dear friend .....to set the google chrome as the default browser ....follow my instructions. Making Google chrome as your default browser is very easy! That's it! from now onwards your default browser will be Google chrome! 1.Open the "Google Chrome Browser"
1.Firstly go to the start menu and then open the Google Browser. 2.Then make a click on the option at the right top of the browser. 3.Then click on the option 'settings'. 4.Then near the Default browser option click on 'Make Google chrome as Default Browser'. 1.Firstly install the Google Chrome browser in your PC. 2.Now open the chrome browser. 3.Now tap on the 'Settings' option. 4.Which is seen on the right side of the browser. 5.Now tap on the option of 'Default browser' option. 6.Now set 'Google chrome' as the default browser by tapping on the option of 'Make Google chrome as default browser'. Search for the default program. After that you can choose the first option. Then click to use it my default program. 1. Click the Chrome menu option on extreme right side on the browser toolbar. 3. In the "Default browser" section, click Make Google Chrome my default browser. 2.Later you open the 'Google Chrome'. 3.Then you go to the 'Settings' option. 4.Then a new page will appear. 5.There you go and search for option 'Default Browser'. 6.There you make a click on 'Set Google as a Default Browser'. 7.Now you make a click on that option. 8.That's it you have made the Google as a default browser in the Google Chrome. 4.select an option there>> make it as a default browser. your chrome will be set as default browser. Its so simple make your google chrome browser as your default browser. 1. Open your google chrome browser and in that your can find settings icon at the end of your browser. 2. click on that and then in that you need to again click on SETTINGS. 3. there you would enter in to a page in that you find a option saying "MAKE GOOGLE CHROME MY DEFAULT BROWSER". 4. Click on it and your browser is made as default. You can do it easily and without any problem. 4) Go to Default Browser. 5) Now, Click on Make Google Chrome my default browser. Firstly click and open the google chrome. From there, click on the settings icon. Now select on the options menu. Scroll down and click on Set as Default Browser option. Confirm the action, save it. =====>Click on the icon look like three consecutive line at top of the Google chrome screen. =====>Setting page automatically loaded after clicking. =====>Under the setting page you will see the button name as Make Google chrome your default browser. =====>After clicking Google chrome Google work as a your default browser.